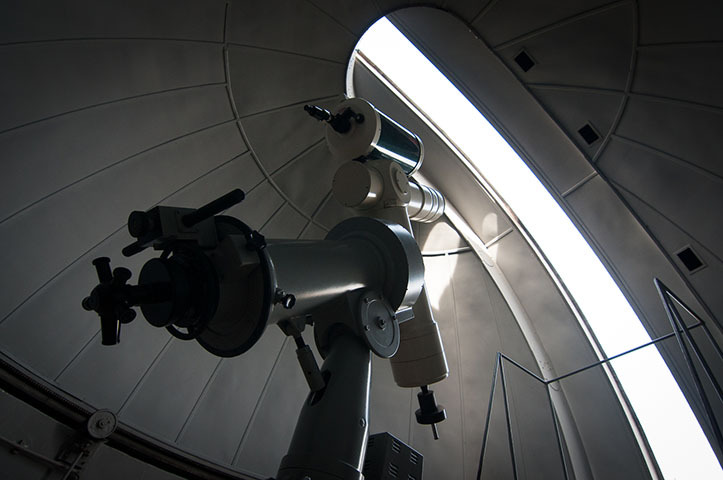 The astronomical work of the university started almost one hundred years ago when the first astronomical observations were made at the first university observatory, built between 1920 and 1934. Since 1982, the Observatory has been carrying its activities in a new building, located in the south part of the Botanical Garden. The observatory staff consists of seven professors from the Mechanics and Astronomy Department of the Faculty of Mathematics and Computer Science, eight researchers from the Institute of Astronomy of the Romanian Academy and students doing their doctorate on this subject. They carry out a wide activity: research seminars on Celestial Mechanics and Space Research and The Structure and the Evolution of Stars, research contracts, magazines and books writing and editing, national and international practical workshops organized each year. The observatory is equipped with a 15cm-lens refracting telescope, an astronomical telescope, a station for artificial satellites’ observation, a photo laboratory, an Internet connected computer network and with other kinds of measuring instruments. The astronomy classes are for the students of the Faculty of Mathematics and Computer Science and of the Faculty of Physics. Classes, seminars and laboratories are held at the observatory and they help students gain the basic and some specific astronomy notions. The observatory also includes a library of more than 16,000 books, which is open daily.